Squaw Creek Park offers a wide range of riding experiences. There’s the original multi-use trail that winds through the park, and then there’s the mountain bike trail system built and maintained by LAMBA. The trails are made up of some amazing hand-built and pro-built singletrack. Irene, LAMBA’s original installation of singletrack at Squaw Creek Park with updated routing and addition of flow elements (berms, rollers, jumps, etc.). This particular trail is rated blue (more difficult) often tight and twisty, requiring lower speed balance and good bike handling skills. The flow elements are also relatively tight and do not ride themselves, requiring skill to successfully navigate. The Red Cedar singletrack crosses a 15 MPH park road twice and connects to blue rated (more difficult) singletrack (Irene) via a connector trail, also more difficult (Mercy Flush / Troll Holler); leaving Squaw Creek with a grand total of 5 miles of singletrack. Mercy Flush, another professionally built singletrack at Squaw Creek Park, is a blue rated (more difficult) singletrack trail packed with flow elements (berms, rollers, lifts, etc.). Use CAUTION – sight lines are good but the trail is TWO WAY -super fun, flowy, and FAST! 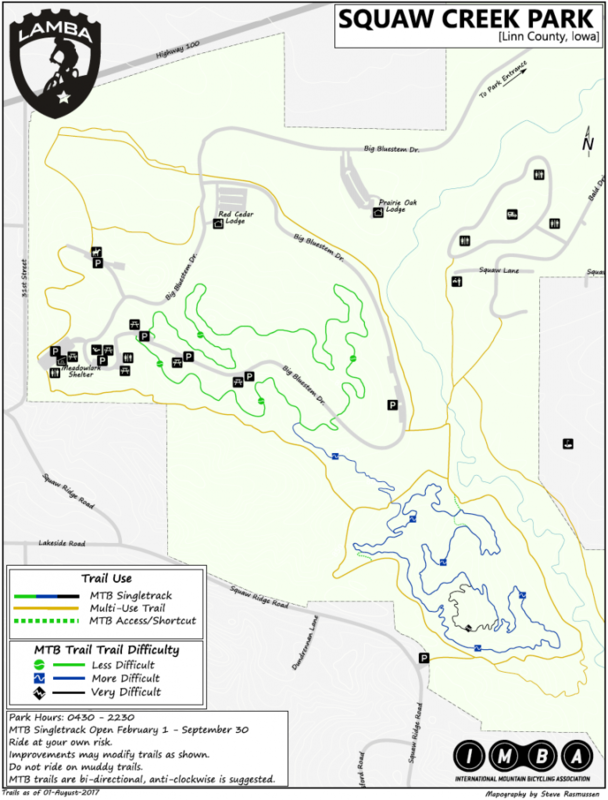 Troll Holler, a continuation of the professionally-built singletrack at Squaw Creek Park, is a blue rated (more difficult) singletrack with flow elements (berms, rollers, lifts, etc.) and two boardwalks that ride just as good, if not better, than the trail. This trail does cross the Squaw Creek Multiuse Trail and connects to Irene, be wary of horses and other trail users!